Beacharr, detail of a carinated bowl from the outer burial-compartment. 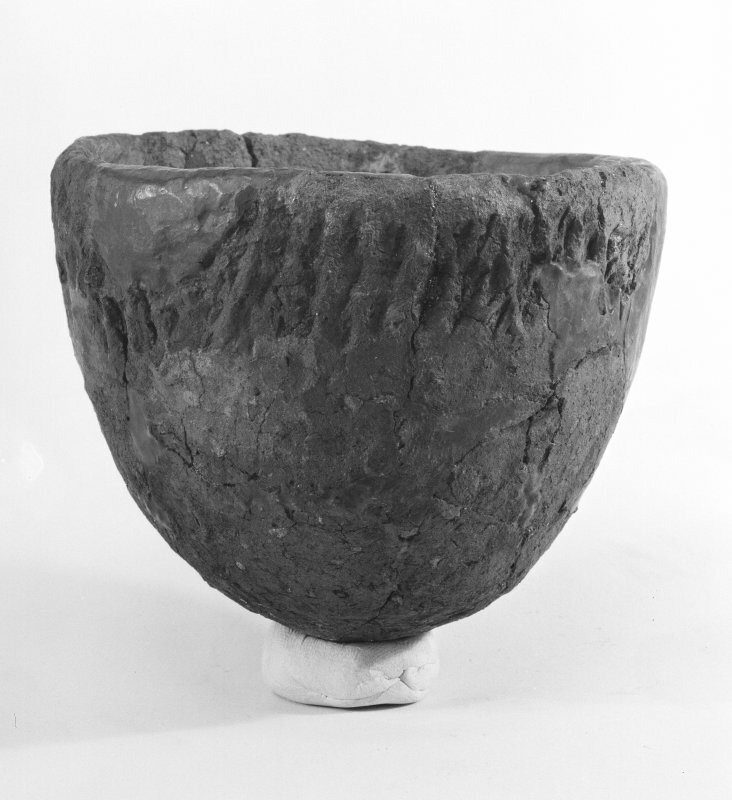 Beacharr, detail of round-bottomed cup from the inner burial compartment. 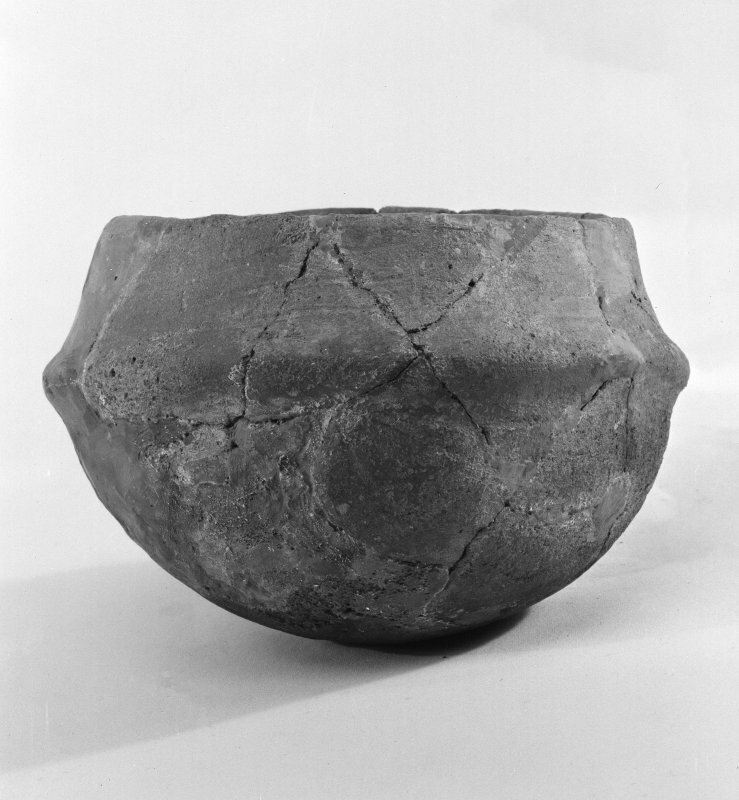 Beacharr, detail of a hemispherical bowl from the middle burial-compartment. Beacharr, detail of carinated round-bottomed bowl from the inner burial-compartment. 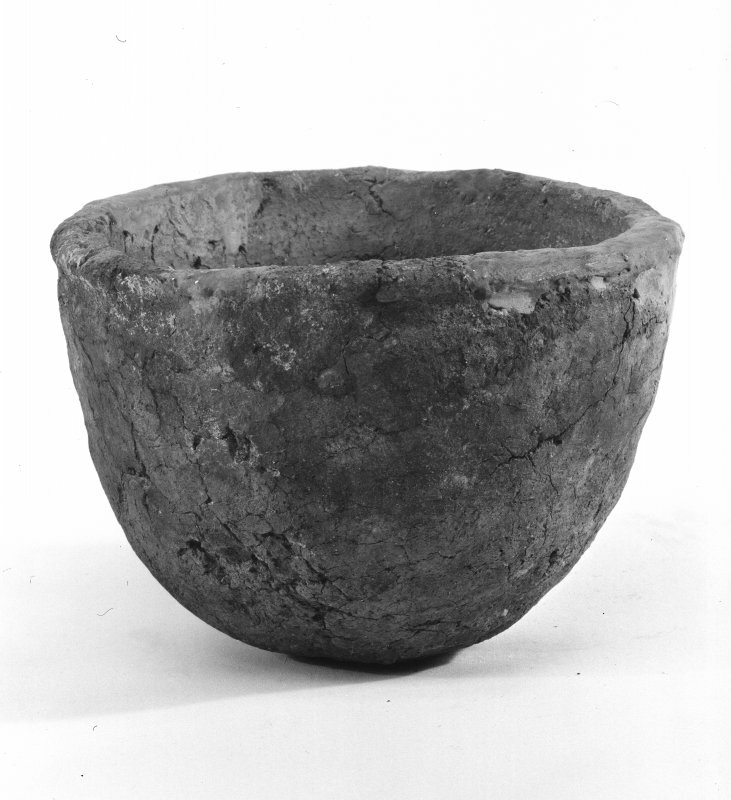 Beacharr, detail of a lugged bowl from the outer burial-compartment. 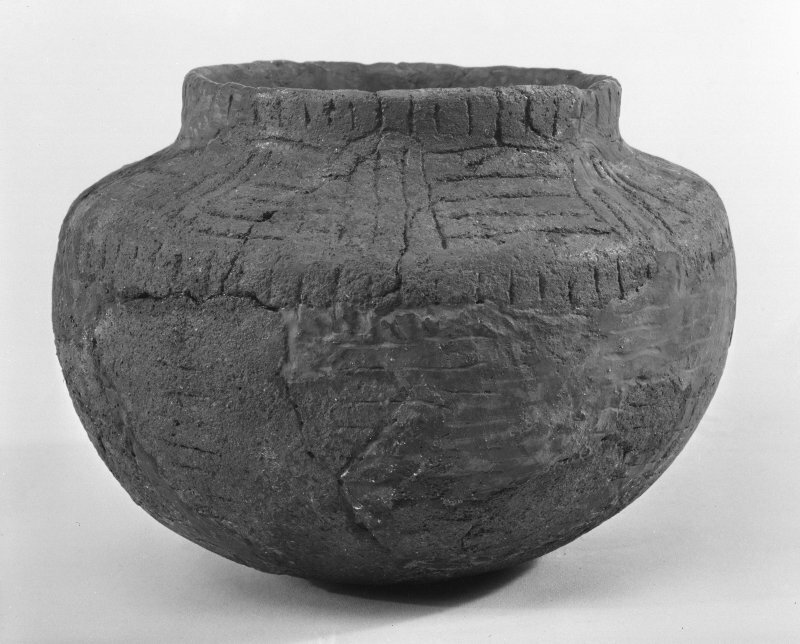 Beacharr, detail of round-bottomed carinated bowl from the middle burial-compartment. (NR 6928 4333) Cist (NR). The remains of the Beacharra chambered long cairn, type- site for the round-bottomed pots which form one of the basic groups of Scottish Neolithic pottery. 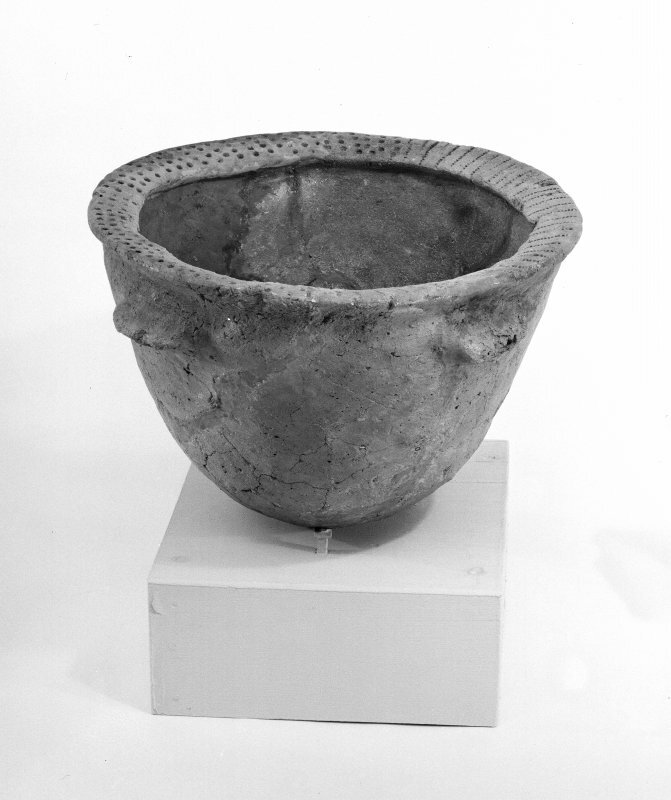 It stands on the spine of a ridge and was excavated in 1892 and re-examined by Scott in 1959 and 1961. At the present time the cairn is an oval grassy mound measuring about 21m by 15m, but it seems likely that it was originally trapezoidal on plan. The chamber was aligned approximately N and S and most of the stones are still visible protruding above the turf. On either side of the entrance, excavation revealed stretches of the facade which was built of dry-stone walling without orthostats, and was generally straight, although a slight outward curve visible towards the W end was probably repeated on the E. Similar walling was found over a distance of 7.3m on the W side of the cairn, and the platform on which it was set appeared to have been revetted with boulders to ensure stability. The burial-chamber, which was 6.25m long and between 1.2m and 1.5m broad, was divided into four parts, comprising three burial-compartments and a short passage or porch immediately inside the entrance. The entrance had probably been sealed with dry-stone walling, and in front of the facade there was a blocking of boulders and earth. It seems likely that during the final blocking the chamber, too, had been deliberately filled with earth. 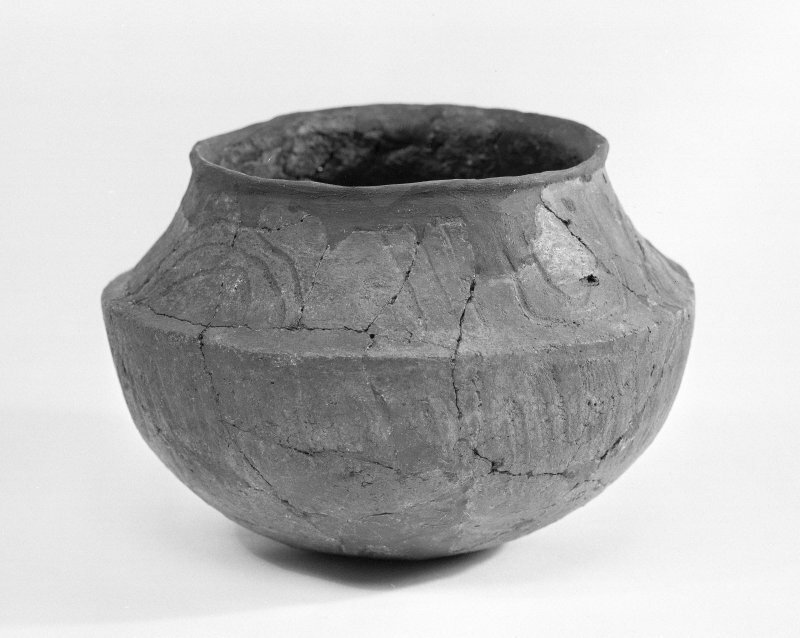 The burials, which may have been inhumations, had left no trace, but two pots were found in each of the three compartments. RCAHMS 1971, visited 1965; J G Scott 1964; A S Henshall 1972. This chambered cairn is generally as described by the previous authorities. The chamber and kerb no longer survive to the degree illustrated on the plan.